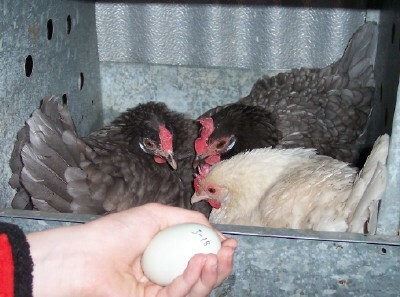 Here is the chick below with her sisters, one month later. Scroll down to follow their progress. From left to right: May, Peaches, Cream, Cinnamon Toast Crunch, Lemon Chiffon, and last, but not least, April, seen below as she was coming out. 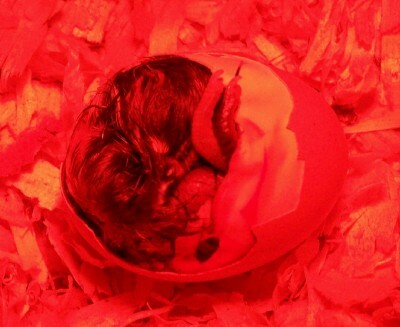 Here comes the new Chick! Our hen, Chickarus was taken from us about March 24th, 2009, (probably by an Hawk,) but on March 25th Mom put the last of Chickarus' eggs under a setting hen, and here we go! The red heat lamp gives the camera lens a red color, but the human eye adjusts to a normal color range. 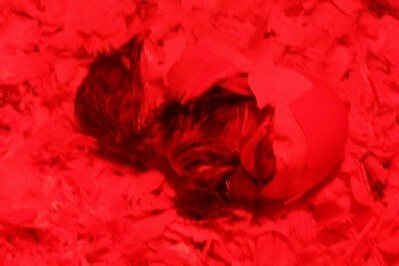 The pictures were a surprise, after being in the coop for three or four hours, to see all the red. 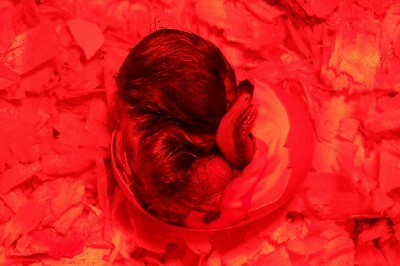 After about an hour of working and resting, the chick has her head out and is taking a break before she starts to work again. Oh Boy ! Wings are both free! What a struggle, must be after 11:00 by now. 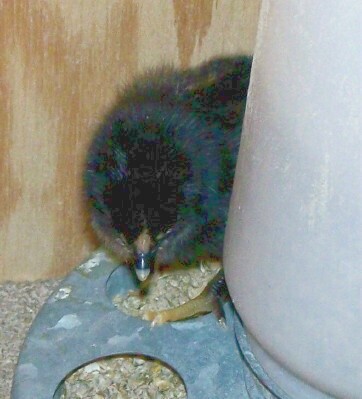 The bantam chick on the right is attentive to the newcomer. When this egg of ours started to hatch, there were already six pullet chicks from the feed store and a nice clean heated nursery ready for her arrival. The other chicks were very curious, taking it in turn to check on her progress, sit next to her to keep her warm, removing pine shavings from her wet feathers, and the like. One more giant effort and she will be free of the shell. But, of course, here is where the digital camera runs out of space. If Mom knew how to upload moving pictures, you could see the whole process in two-minute increments up to this point. 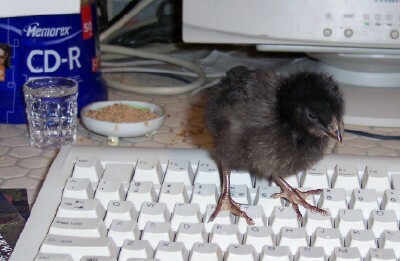 So: 12:45, April 19th, 2009, here is a new chicken. APRIL 2009 CONTEST RESULT: NAME THAT CHICK ! 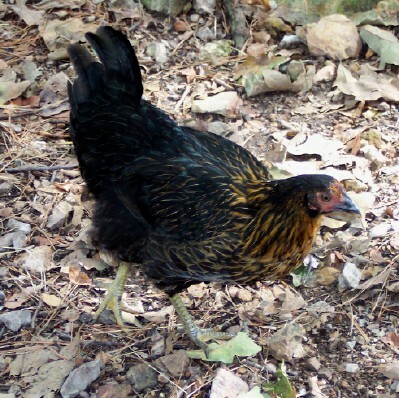 Once again, our New York City friend came up with the best name for a little chicken born in April (...well, duh...) APRIL. Check out this writer and Man-About-Town, Don Shewey. 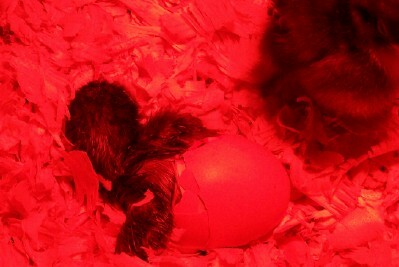 Here is APRIL (in front), about twelve hours after the red images were taken. A little wobbly, but her big sisters are taking care to teach her the ropes. 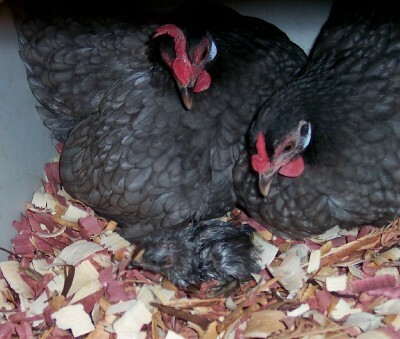 The two black chicks behind her are five day old bantams, smaller than the twelve hour old standard size baby in the front ! And if APRIL is shy or a little chilly, there is always a friend to cuddle under. 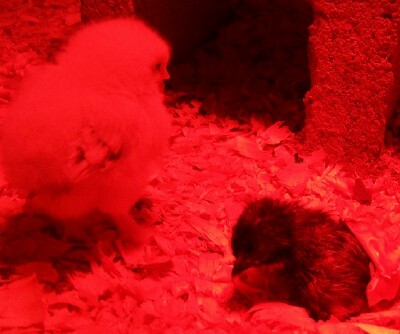 MAY: and the chicks are feathered-out ready for their first night on the roost ! APRIL is on the right end. She is looking feathery and fine! 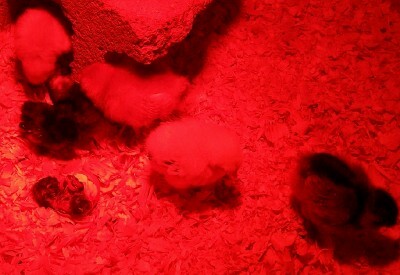 The little chicks are fully engaged in discovering their new surroundings. 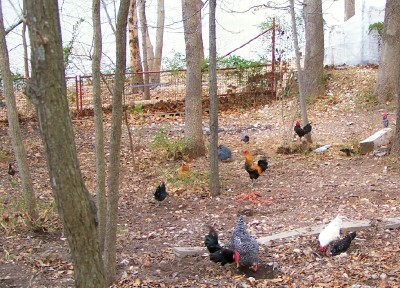 Most of them are interested in the new roost and delighted to be treated like grownups. 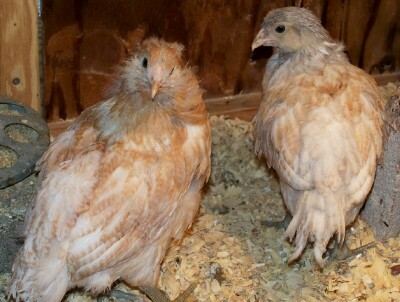 Peaches and Cream are two of April's big sisters. 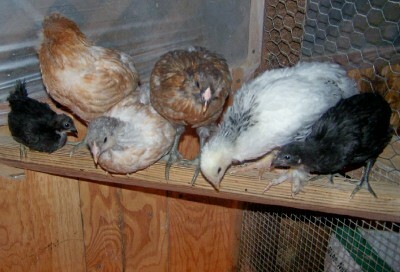 Peaches, Cream, Cinnamon Toast Crunch, and Lemon Chiffon are standard sized chickens. Peaches and Cream and Cinnamon Toast Crunch are clearly Araucanas, the green legs (in this case) indicate green EGGS! Lemon Chiffon will have many pretty feathers on her legs. 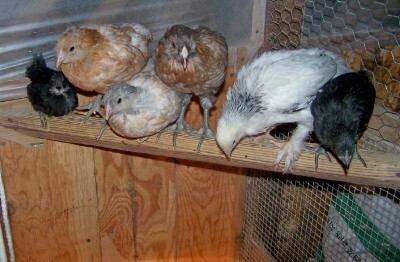 May, the small bantam on the left end of the roost (above) is a bantam with green legs. We will see what sort of eggs Lemon Chiffon, April, and May will lay six months from their hatching. 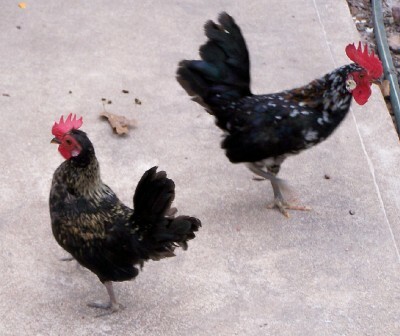 Chickens are marvelously punctual. 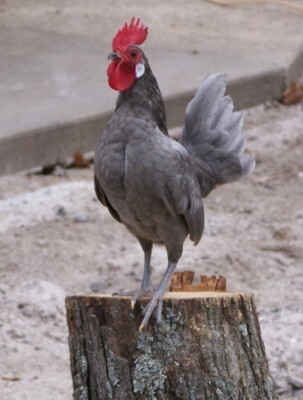 Not only do they rise with the sun and roost at sunset, but they commence laying their eggs precisely six months to the day after they hatch. 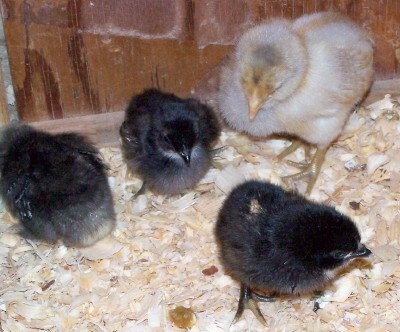 These chicks are all Pullets. 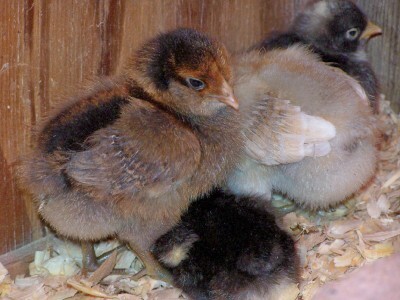 'Pullets' is the name for the young female chickens during their first year. 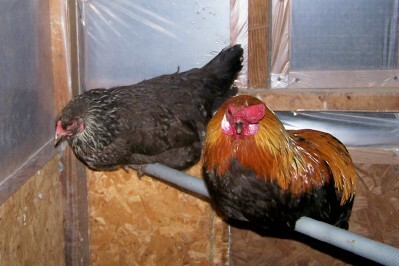 After they have lived a year, they are just Hens. 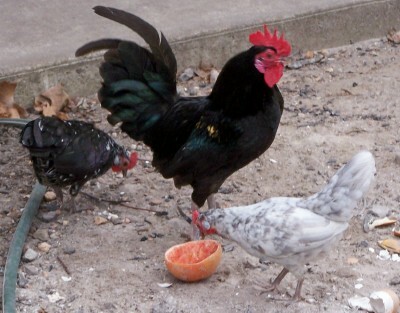 Cockerels are young roosters. 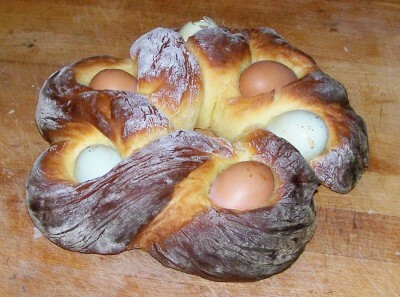 Easter week end, Mom went to the chicken exchange to find a few more hens. We arrived at the exchange right at the end of the afternoon, and Mom was delighted to find an adult Araucana hen available for $12. Mom bought her and took her home. She turned out to be sick with an head cold, leg mites, and had ony one eye. After a few choice thoughts on the farmer who sold her, mom set in to cure all the ailments. Antibiotics for hte head cold, a drop of Ivermectin for the mites, and generous applications of Chick Remedy for both the cold and the mites. 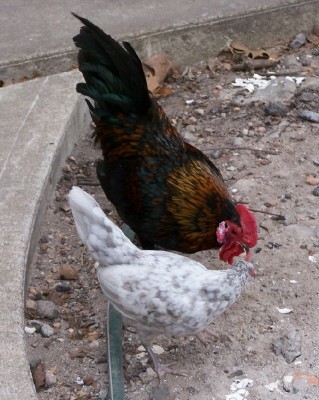 For a month she lived alone in the guest quarters of the chicken coop, but last month she recovered and has a new roommate. Here she is ! Cadbury has begun to lay her beautiful green eggs again, and makes a very nice roost-mate for Foghorn Leghorn, our full-sized rooster. 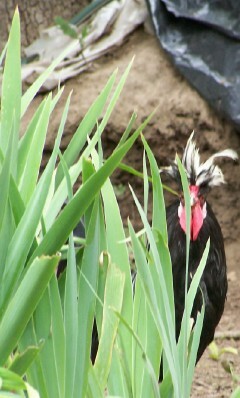 Foghorn Leghorn hatched out of one of our green eggs last summer. Sometimes Mom succeeds. That is alot more fun than the alternative ! Cadbury is one of the more rewarding examples of this theory. New Baby! 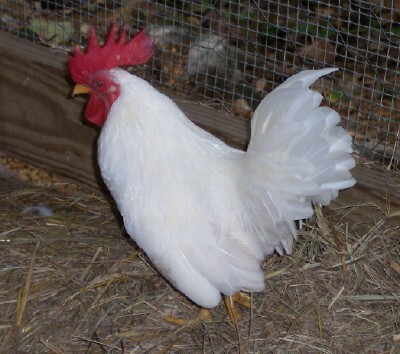 This was Foghorn Leghorn, as a baby...Has he grown! Baby arrived at 9:40 Monday night, April 7th, 2008, with two mothers in attendance. If you look carefully you can see the new baby in the right-hand image. He is all grown up, now, and trying to rule the roost. Remember our Name That Chicken contest 2007? our Name That Pullet from April and May 2007.